The Coburg Town Hall was built in honour of those who served in World War One. The hall was opened in 1923, with further extension in 1928. The original building, built by Cockram & Cooper Builders and designed by C.R. Heather A.R.V.I.A., consisted of a white dome and two wings (each with a hall) with two separate foundation stones. 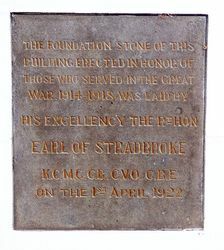 The foundation stone for the soldiers memorial hall was laid on 1 April 1922, by the Earl of Stradbroke, and the municipal buildings by Mayor W.E. Cash. Sixty years of rapid progress has been the lot of the municipality of Coburg. 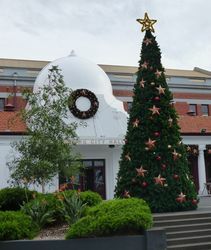 From a bush outpost on the Sydney Road, with a a population of about 250, it has grown until on Saturday it was proclaimed a city by His Excellency the Governor. Two important events were combined. Coupled with the proclamation of the city was the laying of the foundation stone at the new municipal buildings and the soldiers memorial hall. After he had proclaimed the municipality a city, the Earl of Stradbroke was presented with an address and in his reply His Excellency said that one of the first things a visitor to Australia was stuck with was the care taken in the towns and cities to provide for the future welfare of residents. 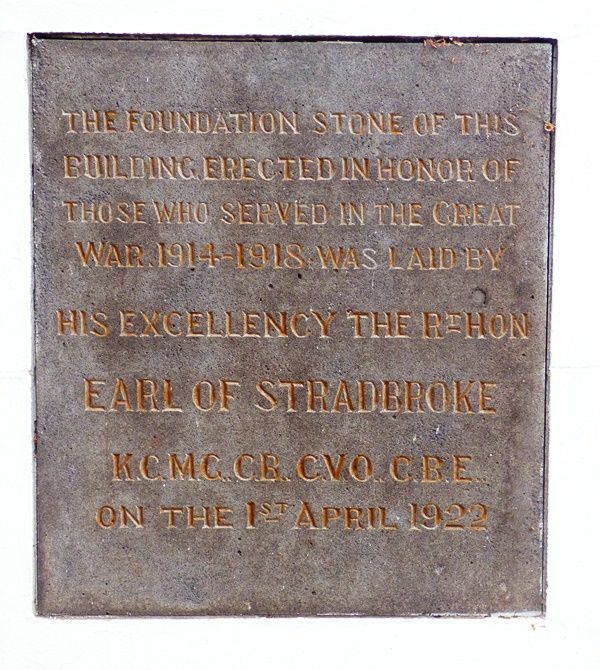 The Earl of Stradbroke then laid the foundation stone of the memorial hall, and the mayor of the city (Councillor Cash) laid the foundation stone of the municipal buildings. Argus (Melbourne), 3 April 1922.